Gladiator's Wide Hook provides versatile storage options for long or awkwardly shaped tools and equipment. Its wide-arm placement makes it the perfect solution for storing leaf rakes and axes. Designed for use on Gladiator brand GearTrack Channels and GearWall Panels (sold separately), it can be hung easily and repositioned as often as needed to accommodate changing storage needs. For ultimate reliability, this built-to-last design is also backed by Gladiator's lifetime limited warranty. 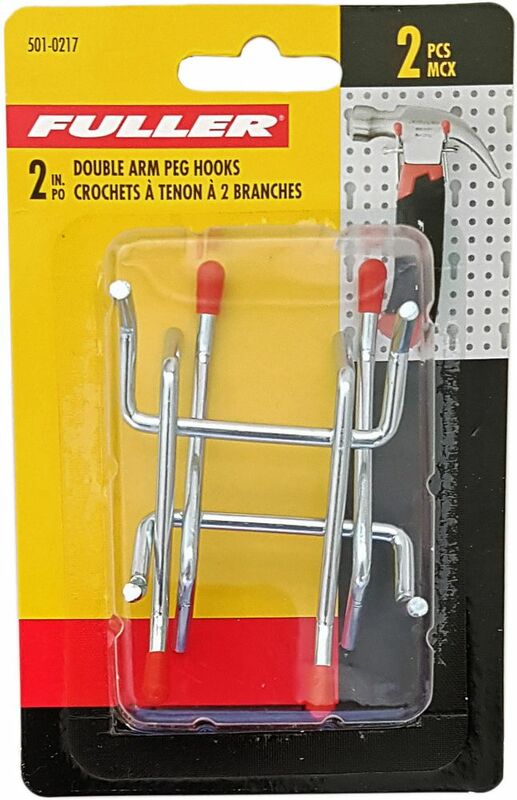 2-inch Double Arm Pegboard Hook with Double Prong Base (2-Piece) A messy workbench not only makes finishing any job that much longer, but looking for tools can be frustrating. These 2-inch double arm pegboard hooks can hold securely in place a wide assortment of tools or items found in every workshop so they're off your working surfaces yet still easy to access. Manufactured from sturdy steel and with plastic caps that help prevent items from accidentally slipping off, you'll want several of these handy pegboard hooks for use in your workspace area.